Love Bailey Jean: Join the Blog Everyday in February Challenge! I love this idea! I've had trouble coming up with blog posts lately, so this will be the perfect way to get my blogging mojo back! this is going to be challenging for me too but i'm excited! What a great idea! Count me in :) I love blog challenges/link ups and this will definitely get me posting a lot more than I have been. 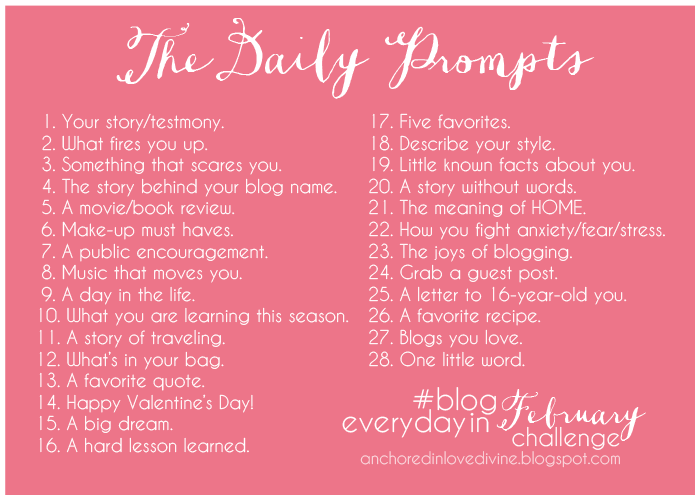 I have wanted to do a blog everyday challenge with my blog. I found your blog and love it and I am super excited to try this! I really love this idea! I've done blogging everyday during a month before and I couldn't always keep up with a post every day because I'd run out of topics to post about. Count me in! Looking forward to the challenge. Just stumbled on your blog via this challenge! I am looking forward to participating! I love this idea! This will definitely help me to be more consistent with posting on my blog! I'm definitely in! What a great idea! I just started my blog this week, so I'm definitely in to get me going. Thank you!